Not to be confused with those colorful french cookies, these amazing little coconut mounds are the business. 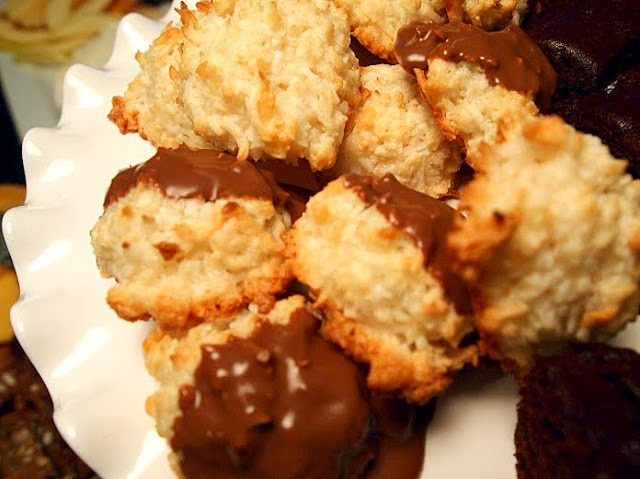 Coconut is one of my all time favorite things so I'm not entirely sure why I didn't make these sooner. They're super simple and give purpose to all those half used bags of coconut in your pantry (please tell me I'm not the only one who has multiples of these at any given time). Mix all ingredients in a bowl (except the chocolate chips, if you're using them). Drop by tablespoon fulls onto a greased cookie sheet. Bake for 20 minutes or until slightly brown. Melt chocolate in a double boiler and dip baked cookies in it. Place them on parchment paper and put them in the fridge until the chocolate hardens. *I used half sweetened and half unsweetened coconut because that's what I had. They were still plenty sweet.